A comment was left on the post Singapore Submarines by mhalblaub who appears to be from Germany. I had noted that the the Singapore Navy hqad acquired from Kockums two Archer Class (Ex-Västergötland Class) submarines under the Northern Lights programme. I had also made a comparison to the length of the Västergötland Class and Archer Class to that of the Australian Collins class vessels – noting that the longer Collins class would provide a better platform for crew in long voyages. Australian submarine crews is one area I have some experience with as my brother-in-law for many years whilst he was in the RAN was responsible for drafting crew – trouble was, crew didn’t want to serve on Submarines and it is a voluntary posting. 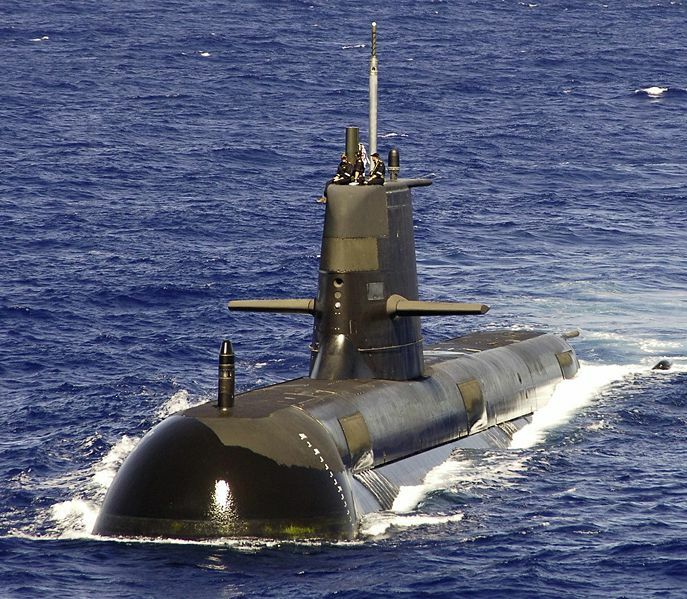 That has been a problem plaguing the Australian submarine fleet for many years now, the difficulty of getting crews together and this is one reason that so few of the Collins-class are at sea at any time. Whilst there is no doubt that the Colllins class building program was best with many problems – welds not to specification from Kockums, large problems with the weapons systems and the ASC being on a learning curve with submarine construction and maintenance, one of the chief issues was and is still crewing. During the First World War, the Australian Navy operated two submarines, AE1 and AE2 and their feats are well recorded in Australian naval history. During the Second World War there were, as far as I am aware, no submarines operated by the Royal Australian Navy. Based in Australia during that war however were may US submarines. During the late 1990s, a combination of low recruitment and retention rates across the RAN resulted in the number of trained submariners falling below 40% of that required. As an attempt to retain submariners, the RAN offered a one-off A$35,000 bonus in 1999. Other measures introduced around the same time included priority transfer of volunteers for submarine training and rotating submariners between sea and shore assignments to relieve them from continual sea service and prevent burnout. A year later, these measures had increased submariner numbers to 55% of requirements. However, the problem with submarine crewing continued; by 2008 the RAN could only provide complete companies for three of the six submarines. So, it may not be a case of the inability to maintain the vessels that is the issue, but rather the reluctance of Australians to serve in small metal chambers generally floating around under the sea. The maintenance problem was documented by Mr John Coles, “an expert from the United Kingdom”. Availability of Collins-class submarine is just 56 percent compared to other international submarine programs (www.navy.gov.au/sites/default/files/documents/Submarine_Workforce.pdf , page III). The problem with missing crews is also a problem related to Collins-class. This submarine needs today a crew of 58 men while other submarines just need about 30 men. Given the poor past history of Australia and submarines, perhaps it would be better if we stuck with what we were good at. Certainly we have generally had a better experience with surface vessels and there are less problems crewing them (apart from sexual harassment, bastardization and such of course).